Kronospan has pre-released its new Kronodesign Global Collection during the Kronoevent 2017 in the historical centre of Nicosia, Cyprus. The week-long event (October 23rd-27th) was hugely successful and attended by over 800 guests from more than 40 countries. The inspiring Royal Hall venue was transformed as day turned into night and provided the perfect setting for the presentation of Kronospan’s new Global Collection. It features 221 designs: 135 in the MF boards range; 28 in Avant-garde, including Mirror Gloss, Acrylic Gloss, Acrylic Matt and Metals; 50 Worktops with 4 Graphic Splashbacks; 4 designs in the Slim Line Collection; Compact Interior and a variety of complementary products. 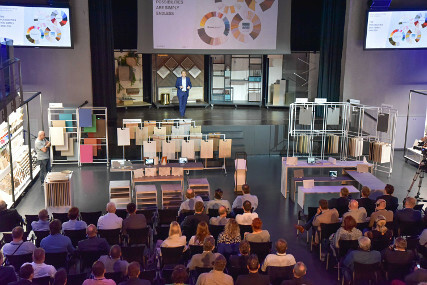 Kronospan’s Design and Decor Manager Mark Bircham gave a presentation about Kronodesign, a brief history about its design journey and the evolution of the brand that naturally led to the creation of the first unified global range of products that will soon be available worldwide. The new trend designs for 2018-2019 were demonstrated with four art installations showcasing the main design themes based on the concept of “Harmony of Contrasts”. The Organic, Expressive, Industrial and Avant-garde installations, as well as the special displays with the new products in Kronospan’s portfolio unveiled the trend forecast for the new Global Collection created to inspire and enable professionals all over the world. Kronospan also announced the launch of a mobile application - a handy mobile tool to help designers mix and match different decors, colors and textures, making sure they choose the best combination of Kronospan’s products anytime, anywhere. The Kronodesign mobile app and the newly introduced marketing materials: Kronodesign Book, Trends Brochure and Swatch set represent the ideal tools to visualize design ideas and bring to life the most demanding interior design projects. The comprehensive range of products in the Global Collection represents the dynamic new contemporary looks so sought after by craftsmen, architects and interior designers and will be available on-stock from January 2018.